Triple M radio station reported about our two Toowoomba puppetry workshops in September 2018. Professional puppeteers Brett Hansen and Elissa Jenkins will run two workshops in Toowoomba this weekend. An award-winning team of professional puppeteers will bring their furry friends to Toowoomba this Sunday (September 16) for two workshops on the art of puppetry. 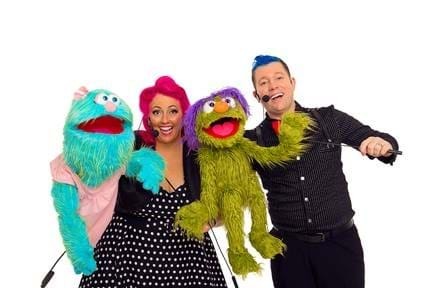 The workshops will be run by Larrikin Puppets owner Brett Hansen, who trained in the USA under Jim Henson puppeteers from The Muppets and Sesame Street, and Elissa Jenkins, who received puppetry training at The Puppet Kitchen in Manhattan, New York. Toowoomba’s Shoebox Theatre Company will host the workshops at Dance Central Studios. Mary Quade, co-owner of Shoebox Theatre Company, said they would appeal to anyone looking to increase their performance skills, and especially those keen on auditioning for the musical comedy, Avenue Q, later this month. “These four-hour workshops give those wanting to learn the skills of puppetry a chance rarely given in Toowoomba,” she said. Ms Quade said the workshops, to be held on Sunday, September 16 from 9:30am and 2:30pm, were suitable for all ages. Avenue Q will be showing at USQ Artsworx in February 2019. Known for banging out the best of Barnsey, Farnsy, Acca Dacca and loads more rock in stereo, it sure was nice of Triple M to take the time to report about Larrikin Puppets. Good onya Triple M!